It’s no surprise that summertime is many people’s favorite season. With the ever-growing heat and sun exposure, our clothes get a little shorter and looser and our feet start to feel a little caged in by our socks and shoes. Slipping on some flip-flops is one of the most pleasant and liberating wardrobe changes that comes with the change in season. But, as it turns out, flip-flops aren’t good for your feet and ankles. In a first-of-its-kind study, researchers at Auburn University studied the effect of flip-flops versus sneakers on gait kinetics and kinematics. If you think about it, what they found isn’t surprising; sneakers are closed and provide sole, arch, and whole-foot support while flip-flops give no foot support whatsoever. 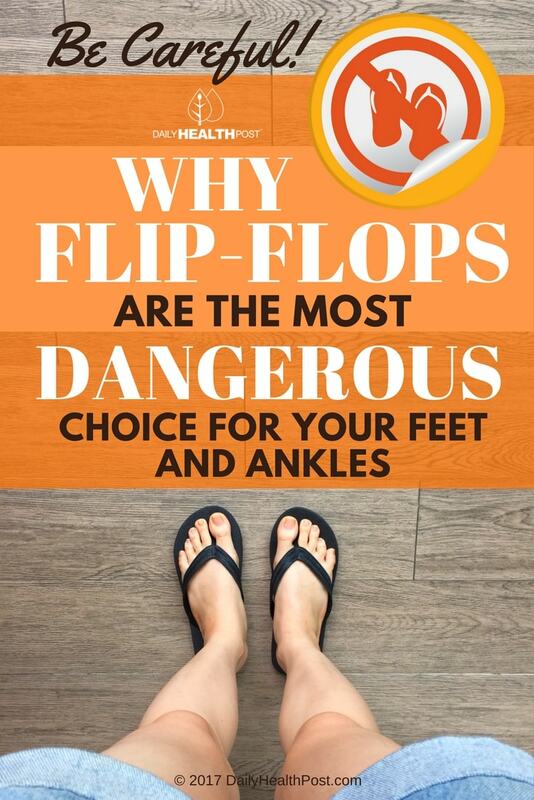 They found that people who regularly wore flip-flops had a shorter stride and their ankles stood at an awkward angle as their foot left the ground with every step (1). Over time and constant use, wearing flip-flops can cause foot, ankle, leg, and back pain due to the awkward stride they cause. Furthermore, the foam-like materials used to make flip-flops become slick when damp. If your feet sweat (it is summer, after all), your foot will slide on the sole and the thong that goes between the toes will rub against them and the tops and sides of your feet, causing blisters. The footwear also causes your toes to scrunch with each step to keep a grip on the shoe and extensive wear can cause pain in the tendons of the foot and little piggies, too.